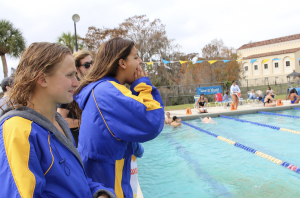 As the Rollins swim team celebrated its departing seniors during last weekend’s meet against Lynn University, the swimming Tars’ new generation rises to the top. One of the distinguished members of the up-and-coming cohort is Beatriz Olivieri (‘22) from Rio de Janeiro, Brazil. Olivieri made herself at home in the Alfond Swimming Pool by winning the 200-yard Individual Medley on her debut. She continued with a streak of wins and convincing performances, culminating in the Panther Invitational at Florida Tech. Within that same weekend, Olivieri broke the school record in the 200-yard butterfly and 500-yard freestyle (currently held by fellow freshman Sydney Willis). As of the publication of this article, Olivieri holds the top three fastest times in the nation in the 200-yard butterfly. As a child, Olivieri was recommended swimming to help her deal with asthma and bronchitis. “Back then, it was much more about being with my friends. The team vibe was what kept me going, because I wasn’t really good initially,” she recounted. Olivieri revealed that she started competitive swimming in 2009: “In my family, everyone had to do some kind of sport, particularly when we were younger. I liked it a lot, but the training schedule was always rough.” In a similar fashion, her older brothers had taken up soccer and martial arts. Eventually, with all its advantages and scholarships, swimming for the Tars provided a path to the future for Olivieri. Even though it sometimes felt beyond reach, Olivieri trusted herself. 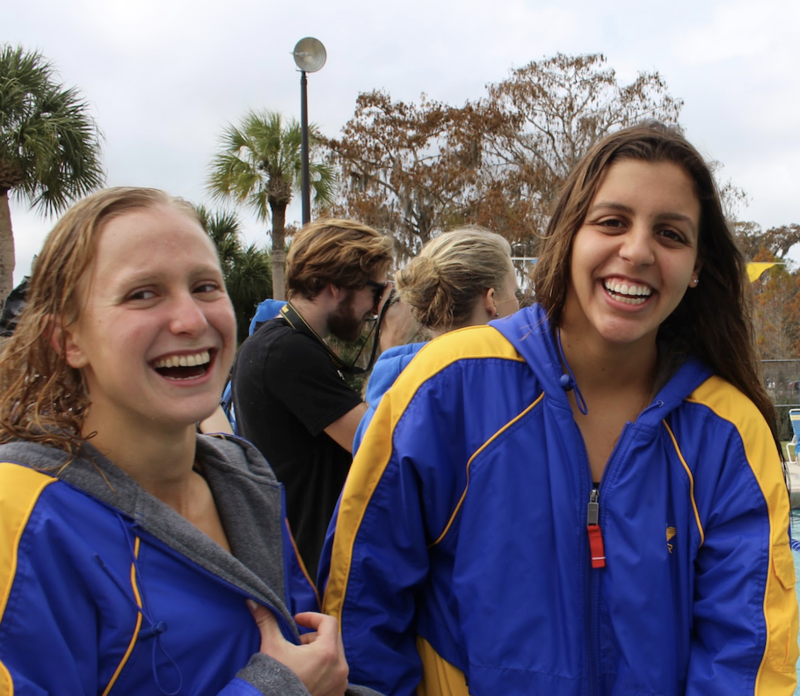 “Coming to Rollins is the fulfillment of a dream, something which I worked very hard for. Sometimes in class I have these moments when I’m just like, ‘Wow, I’m really here. It actually worked,’” she said. As a tournament that boasts the highest GPA in the country, the Sunshine State Conference considers academic success a prerequisite for triumph in the pool. The coaching staff was certainly appreciative of Olivieri’s academic excellence, but Olivieri’s enthusiasm and selflessness are the qualities that particularly stood out to Assistant Coach Julianne Kurke. Nonetheless, college swimming brought its fair share of personal challenges for Olivieri. Team chemistry was an important criterion for Olivieri when she was deciding between her college offers. She admitted that she thrives in the presence of others. With two weeks left until the Sunshine State Conference Tournament, the team enters taper, which means the intensity of training drops so the swimmers are fully rested for competitions. However, coaches have their eyes set on the next stage already. “We’re pretty optimistic she will be invited to the NCAA championships, so with that information, we want her to taper and peak specifically in mid-March,” Kurke explained. This means Olivieri will be training more than everyone else ahead of conference. However, just the idea of competing at a national level provides her with all the motivation she needs. When asked about her long-term objectives, her answer was reflective. “I want to leave feeling like I did a good thing for the team. 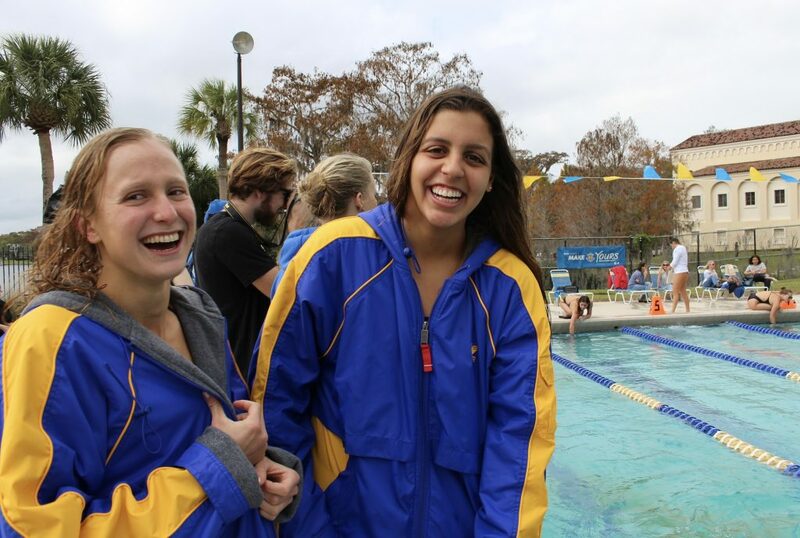 I feel like we, the current swimmers, are responsible for putting the swimming team in a better place,” she said.